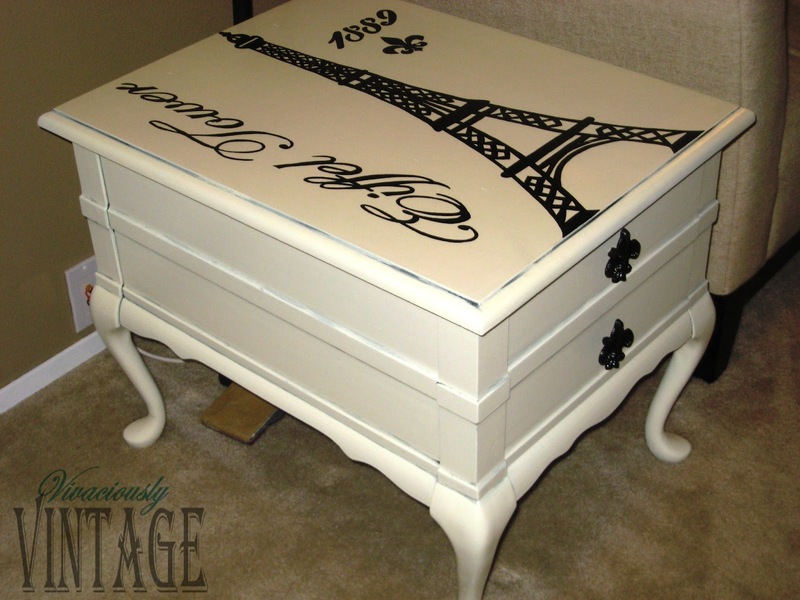 Ansley Designs: Eiffel Tower Accent Table - Oui! Je t'aime! 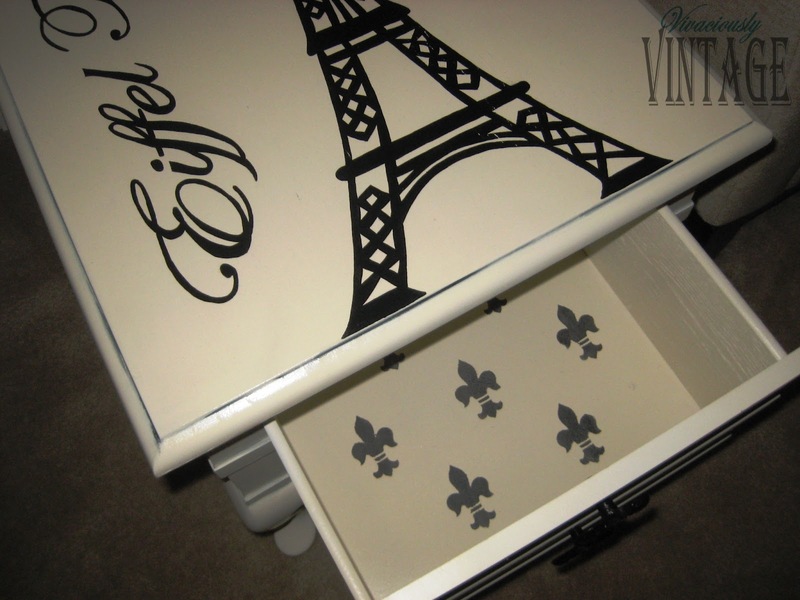 Eiffel Tower Accent Table - Oui! Je t'aime! First I gave her a good wipe down and two coats of KILTZ primer. The primer was followed up with several coats of Krylon ivory. Simple enough, right? As soon as I saw her I knew I wanted to do some type of, as I call it, "Frenchy" typography. 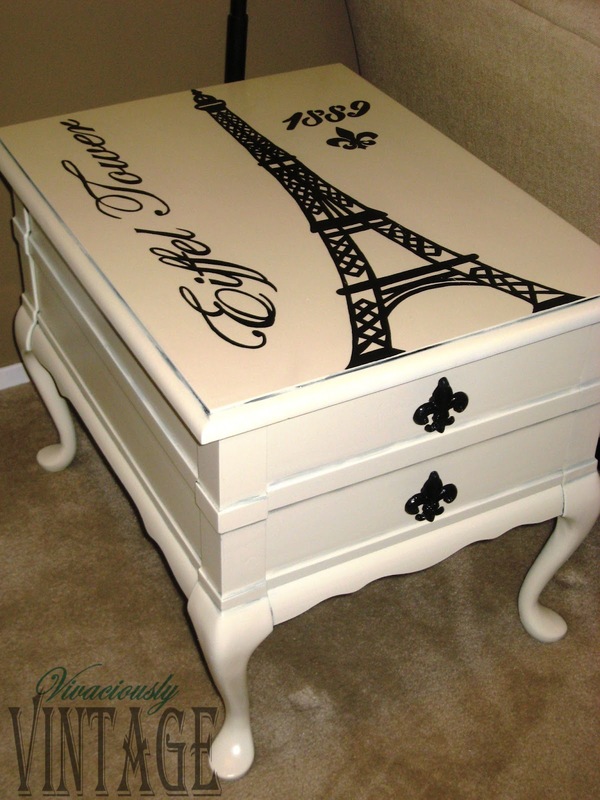 So I did a little searching and created a custom design using the Eiffel Tower, it's date of completion, a Fleur-de-lis, and the words "Eiffel Tower" in a beautiful typography print. I tried several methods of recommended transfers. None of them worked. There were a few others that looked promising, but I didn't have all the necessary supplies - and, impatient me, couldn't wait until the next day to get them! So I used what I had! Initially I printed the design out reversed because that was what the initial transfer instructions required. However, my way doesn't really need it reversed - in fact, it would be easier the normal way. So, I colored the "correct" side (the side that I wanted it to be facing) with chalk. I used blue because it seemed to be the darkest that I had. Then I laid the design on the table chalk side down. 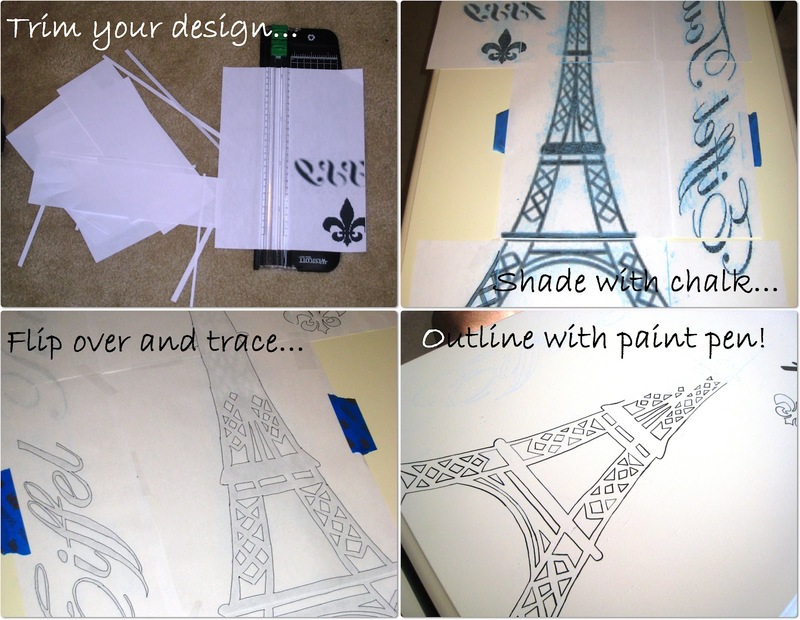 Next, take a pen or a pencil - whatever - and trace all of the lines of your design. This should leave a nice tracing pattern on your piece. I used a Sharpie paint marker to trace the outline, so I had a more permanent guide for my painting. I used acrylic paint to fill in the picture. The top of the tower was difficult to trace, so I just free-handed that portion. If I had not reversed the design, it would have been easier to follow the lines if they were face up and not face down. I can never leave the inside of my drawers alone! This time, instead of lining them, I painted them! Then I used a Fleur-de-lis stencil to add that much loved hidden character! Once the picture was complete, I dry glazed the piece along the nooks. This is the perfect technique for a piece that is mainly flat. I'll post a tutorial soon. It's really simple! 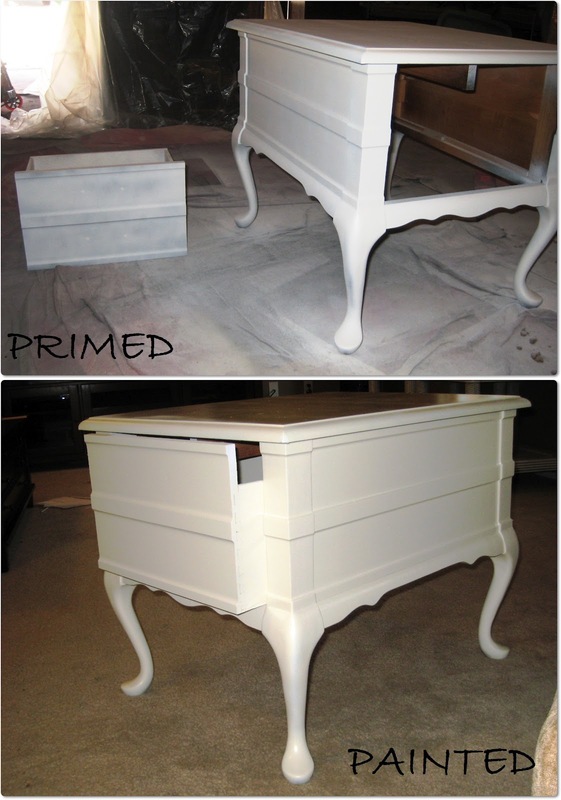 Probably the most important step is protecting all that acrylic paint on the table top. First I used spray Polycrylic. I sprayed it on first to give an initial layer of protection against my foam brush. Once that was dry, I brushed the remaining layers of polycrylic on for a more protective and smooth finish. 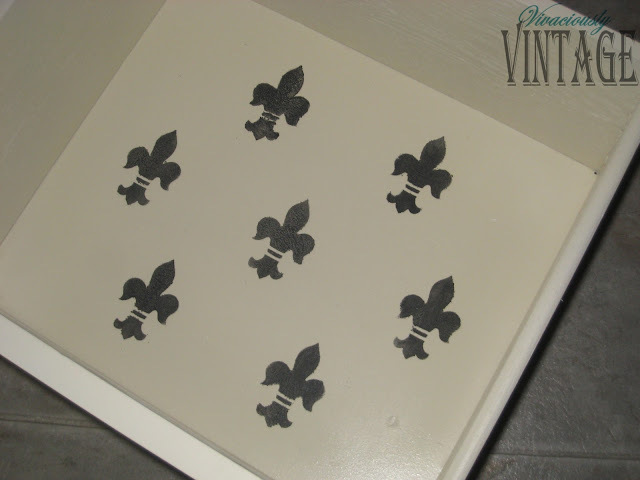 When everything was dry, I added those awesome iron Fleur-de-lis drawer pulls! Oui, c'est tres magnifique! Je crois je vous esayer quel que chose come ca aussi! My French writing leaves quite a bit to be desired, I learned by immersion in the culture :) I was attempting to write that I agree it's wonderful! I might try something like this too! Found you on DIY Dreamer... Gorgeous! Oh! That turned out awesome! I am very inspired by all of your projects, and am now on the look out for pieces that I can transform. The only suggestion I would have made for this one is having the writing be in french...'la tour Eiffel' would be a nice "authentic" touch, but again very inspiring.